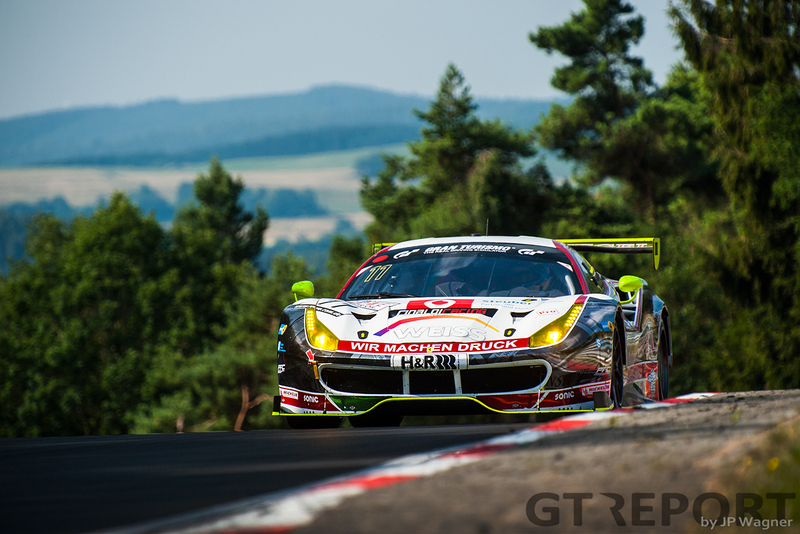 The first days of summer holidays in Germany started with Frikadelli Racing doubling down on its VLN victory two weeks ago. 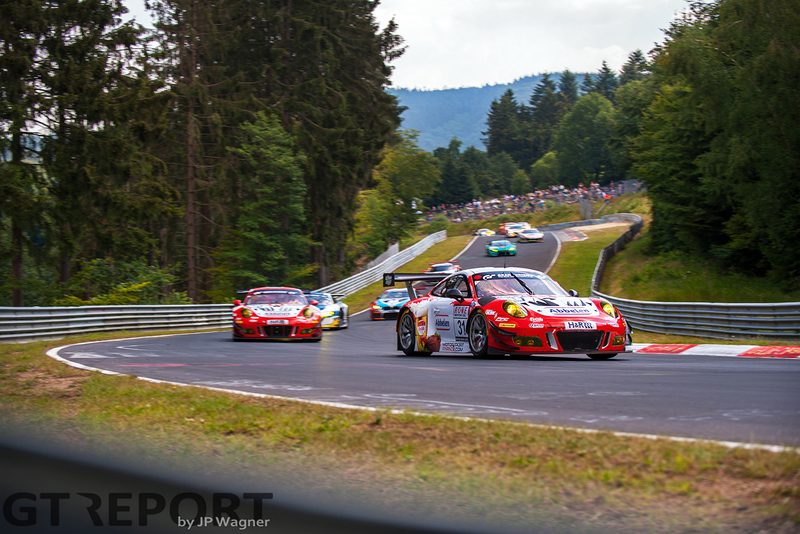 Under a scorching sun the Porsche 991 GT3R crew from Barweiler raced to victory at the Nürburgring, with Lance David Arnold and Norbert Siedler putting the might of Porsche on display in the 49. Adenauer ADAC Rundstrecken-Trophy. 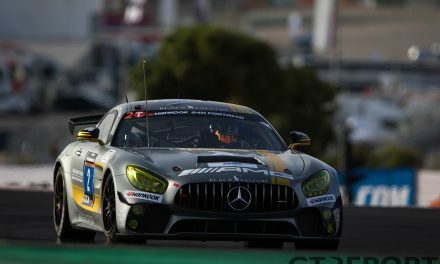 The Klaus Abbelen-led team started from pole position and remained in control throughout the 4 hours of racing, making its return to fighting prowess definite. 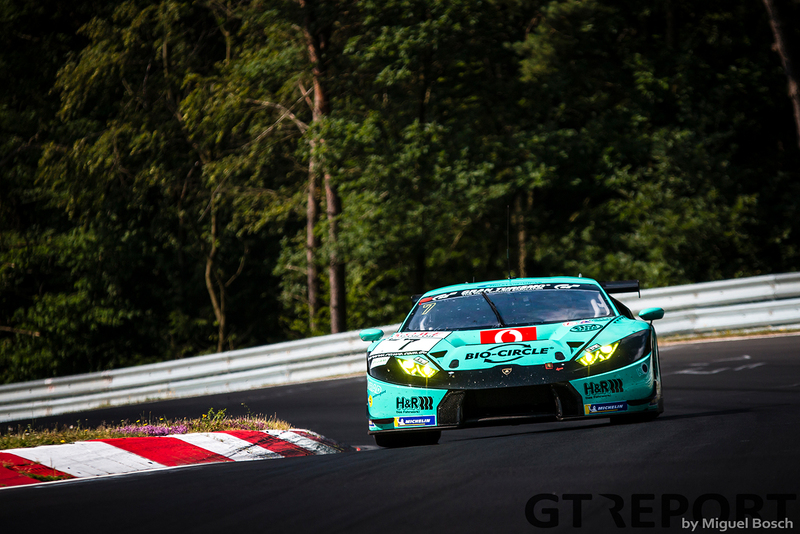 Split only in the closing moments of qualification by the Walkenhorst Motorsport BMW M6 GT3 of Jonathan Hirschi, Frikadelli Racing sets the tone for race day. 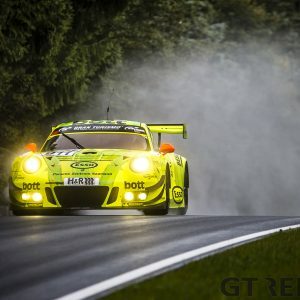 Norbert Siedler, back at the Nordschleife after missing out on his team’s VLN3 victory party due to Blancpain GT duties, is unrelenting in his pole lap, clocking in at an astonishing 7:56.644. Team-mate Felipe Fernández Laser chases at almost 4 seconds, while Hirschi is the only one to follow Siedler into the sub-8 minutes. The Swiss’ laptime, however, is scrapped along with his licence: much to the anger of the stewards, Hirschi sets the quickest sector time of the session while speeding through a Code 60 zone. Siedler’s no-holds-barred lap lays the foundations for a domineering drive to victory. The Austrian himself leads the field to the green and with a clear stretch of track in front of him, leaves the wide open grass fields of the Grand Prix course and disappears into the forest of the Green Hell. Behind the Austrian, the sister Frikadelli Porsche of Laser has more trouble maintaining the pace. He’s swarmed at the start by the two Wochenspiegel Team Monschau Ferrari 488 GT3s driven by Oliver Kainz and Christian Menzel, dropping him down to fourth place. When Michele Di Martino in the Konrad Motorsport Lamborghini Huracán GT3 at the end of the opening lap slipstreams past the Porsche and Frank Stippler successfully attacks at the braking for the first turn, the die is cast: Laser, Abbelen and Sabine Schmitz won’t be fighting for the prizes today. Di Martino continues his march to the front. At the end of the second lap he sits in third place, separating the Ferraris. Di Martino is flying, but if the 2018 season has taught him anything, it’s that bad luck always lays waiting to strike—and again it does. Siedler is still under the presumption of a slow-zone when he cruises down from Eiskurve to Pflanzgarten on the third lap of the race. Doing his prescribed 60 kilometres per hour, the group of pursuers suddenly comes charging at him at race speed. In the ensuing melee of a yellow-gone-green, Di Martino gets tangled up with a lapped BMW and smacks into the Pflanzgarten guardrail. The youngster is OK, but his car is not. With just 3 completed laps, Di Martino retires the Lambo with a broken right rear corner after the long crawl back in the pits—another one lost for the Franz Konrad-headed outfit. With the Lamborghini out of the mix, the race becomes a straight forward affair. 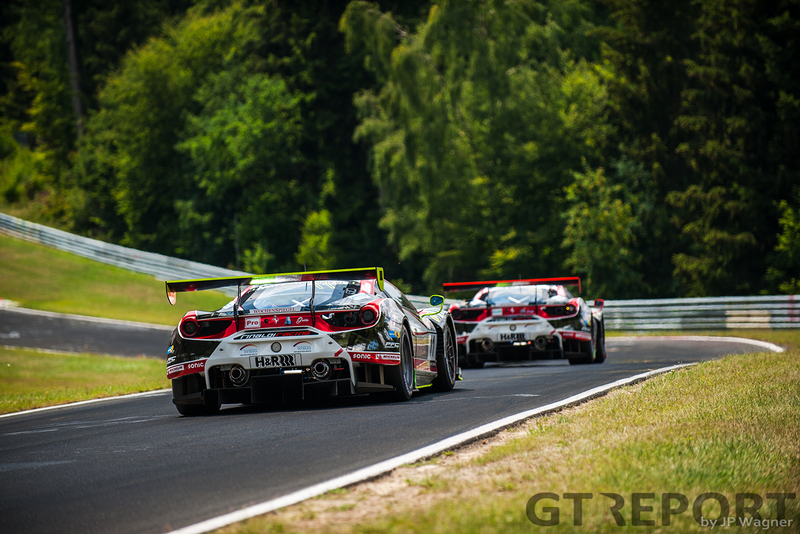 Frikadelli Racing maintains its high pace—Siedler having to fend off Kainz in the number 22 WTM Ferrari for the next few laps after losing all his won seconds in the Pflanzgarten Code 60 confusion. An early pitstop shortly before the end of the first hour gives Frikadelli Racing the advantage of a shorter minimum pitstop time. When the first round of pitstops has cycled through, Arnold siphons back into the lead and opens a growing gap over the number 11 WTM Ferrari of Christian Menzel, who has taken over from his son Nico Menzel. 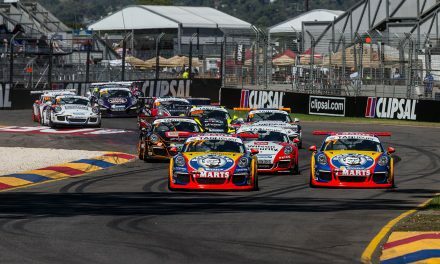 The beautiful symphony between car, tyres, drivers and strategy refuses anyone who wants to make a serious attack on the number 31 Frikadelli Porsche. It’s Frikadelli Racing’s race to lose and almost they do when Arnold comes up a traffic jam on the long Döttinger Höhe. He sees neither the yellow flags nor the Code 60 signs explaining the phenomenon, so decides to zig-zag his way through the heap of cars. 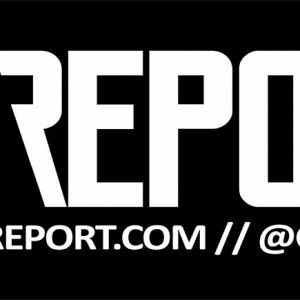 Discussions of whether the overtaking was done under yellow or not persist throughout the race and into the weeks after the race. With the threat of a penalty looming over them, Frikadelli Racing battles on. Arnold and Siedler, switching places at every pitstop, expand their gap to the Ferraris to a minute and a half at the finish of the 4-hour race. Despite the 35-second time penalty awarded weeks later, Frikadell Racing celebrates its second win in a row and the start of a new era of success. For the number 11 WTM Ferrari team, a dream comes true: the Rinaldi Racing-run car with father and son Christian and Nico Menzel and Leonard Weiss, son of WTM patron and driver Georg Weiss, takes its first podium finish. 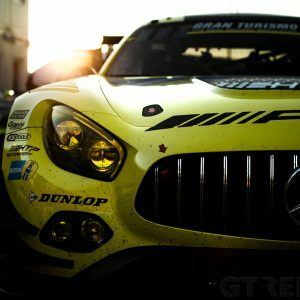 Where Christian Menzel’s status as Nordschleife expert is undisputed and Nico’s been proving himself a worthy pick of BMW for the Junior program, the young and inexperienced Leonard Weiss was the big unknown going into the season. All the coaching done by mentor Christian Menzel this year has paid off: the younger Weiss wins the father-son duel for second place in the final stint. Realising Frikadelli Racing was unbeatable today, the Rinaldi Racing squad celebrates its two podium finishes. Kainz runs strong in the first stint, but the team isn’t able to offset its two additional laps in the first stint—resulting in a longer minimum pitstop time—by a shorter minimum pitstop time at the end of the race. 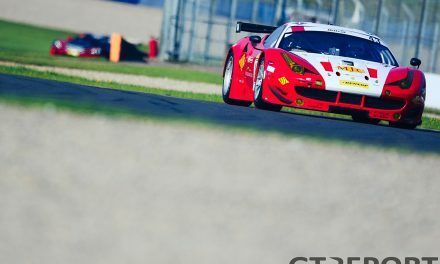 Georg Weiss brings the WTM Ferrari home seconds in front of Frank Stippler. The Audi works driver is going for a final assault in the Phoenix Racing Audi R8 LMS GT3, taking fourth place from Frikadelli Racing’s number 30 Porsche in sight of the finish flag but coming short of the podium. Frikadelli Racing’s next point of measure will come after the summer holidays. 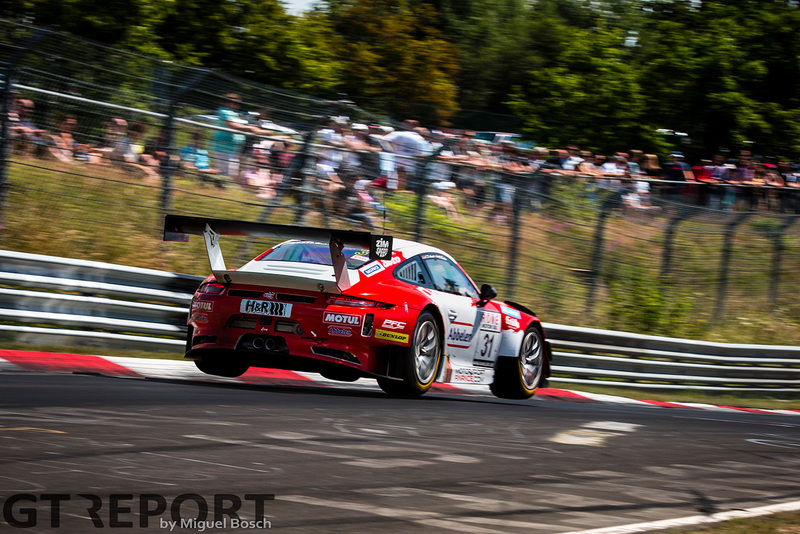 At the mid-August VLN 6-hour race the Porsche team will meet the challenge of the return of the factory teams.